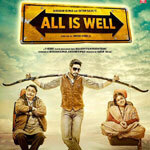 "All Is Well" is a 2015 hindi film which has Abhishek Bachchan, Asin, Rishi Kapoor, Sonakshi Sinha, Supriya Pathak, Mohammed Zeeshan Ayyub and Harry Josh in lead roles. We have 2 songs lyrics and 2 video songs of All Is Well. Meet Bros Anjan Ankit and Himesh Reshammiya have composed its music. Kanika Kapoor and Ankit Tiwari have sung these songs while Kumaar and Mayur Puri have penned its lyrics.